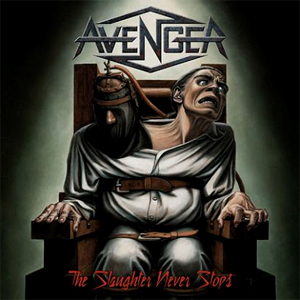 Rocksector Records have signed classic NWOBHM legends AVENGER and will release the band's third album, The Slaughter Never Stops, on September 1st. This is the band's first new release since Killer Elite in 1985. The Slaughter Never Stops was recorded at Blast Studios (Newcastle, UK) and Leather Bear Studios (Sunderland, UK). Engineered and mixed by Dean Thompson. Brian Ross, Mick Moore and Gary Young founded AVENGER late in 1982 following the break-up of BLITZKRIEG. Their debut single, "Too Wild To Tame", followed in October 1983. Shortly after, lead singer Brian Ross left to join SATAN, whilst SATAN's singer Ian Swift made the opposite move to join AVENGER and so the band's classic lineup released a debut album Blood Sports in 1984 on Neat Records and toured Europe extensively. The band's second album, Killer Elite, was released in 1985, again on Neat Records, along with three music videos and later a tour of the United States, yet after returning to England the band split, with Ian Swift joining ATOMKRAFT and Gary Young later joining BLITZKRIEG. AVENGER's entire discography was re-released in 2002/2003 by Sanctuary Records, the band reformed in 2005 and has since toured across Europe with US rockers Y&T, also appearing alongside TWISTED SISTER, CANDLEMASS, SAXON, DIAMOND HEAD and RAVEN. Now reunited with classic lineup vocalist Ian Swift, a new chapter begins with shows across Europe and a new album, The Slaughter Never Stops. Mark Appleton of Rocksector Records says "Hooking up with AVENGER is an exciting step. On the one hand the new album is of course a much anticipated event from a band with history and heritage, but also when listening to the song "Fate", available now as a free download, it's clear how relevant and vibrant this music remains."